on the threshold to welcome the Goddess. the Little Food Junction way !!!! using a circular cookie cutter or a bottle cap . slice to make a drop shape flame. Assemble . the sprouts /soaked /boiled lentils & veggies. ones will have is surely worth it !!!!!!!!!!!!! Lovely.. Brilliant as always!! Happy Diwali to you and your family!!! Just today surfed ur blog... interesting and innovative. i like the diyas. R the footmarks made out of chocolates? happy diwali to u & ur family...and to all the followers of ur blog. Hi. Simply amazing Smita. Wish u and ur family a happy diwali. 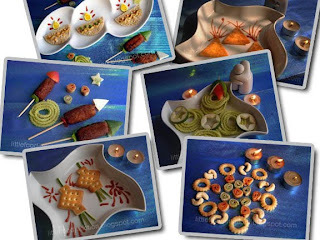 Very beautiful creations ... A very happy Divali to you & your family . Amazing!A very happy diwali to u and ur family! OMg...How beautiful..and so creative...Love it. My fav wd have to be the peacock though...Wishing you a happy Diwali too. First time here but will be visiting u often. What an amazing decoration. Diyas look beautiful. The entire rangoli is fabulous. Diyas are beautiful... quite lively when u look at a small image.. Happy Diwali to u n ur lil one Smitha! 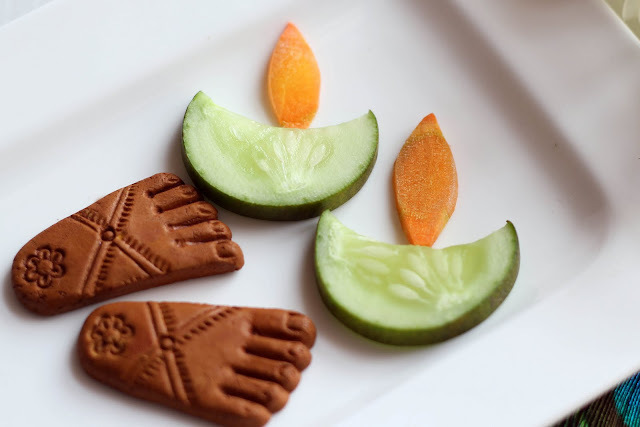 The edible rangoli is simply stunning! Cute and awesome work again, loved that edible rangoli..
Diwali wishes to u and ur family..
Wonderfull creations, as usually Smita! Hi, Smita, today I am back from sick leave and doing well! Glad that I did not miss any of your posts!! These are all just delightful! The lamps anyone could do, and the bird (a peacock?) is just exquisite. It may take time, but not very hard. You have outdone yourself this time!! love love the edible rangoli, I wouldn't eat that though as I don't want to spoil the beautiful peacock :) Happy Diwali to you and your family! This is Sunita from Singapore.Happy Deepavalli.I want to thank u from the core of my heart.Reason, when i was looking for a zoo/safari theme decoration on sandwich n couln't find anything simple yet beautiful for my kids' sandwich competition, suddenly i came across ur blog.You know what my kids used the pig face decoration n won the first prize.So,thanx so much n keep posting like this. Absolutely gorgeous!!! Happy Diwali to you! A very Happy Diwali to all of you too !!! Thanks for all ur lovely comments..
Also a very warm welcome to new viewers & followers , hope u enjoyed ur visit here . Your blog is amazing! Very inspiring! Even I making different Rangoli designs every year. This Diwali I am surely going to pick something from here. Lovely designs must say! Thanx for sharing. This blog is too good..